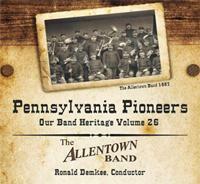 If you enjoy wind band music of the toe-tapping and head-bobbing variety, or appreciate Pennsylvania musical history, you're sure to be delighted and captivated by the Allentown Band's latest release. Pennsylvania Pioneers celebrates 18 composers from across the Commonwealth, from the mid-19th through the mid-20th centuries. It's mostly marches, but with an occasional concert waltz, suite, and medley thrown in for good measure. Actually, make that many good measures! With a few exceptions, outside of the towns, military regiments, companies, school systems, and even circuses where they lived and plied their trade, little is known of these composers. But the sympathetic performances their music receives on this recording reveal talented craftsmen who produced highly tuneful and original works in the wind band tradition. This is highly enjoyable music definitely worthy of discovery. We discover some remarkable stories, too. Arthur Davenport of Shickshinny turns out to have been the band director for a young man in the Aliquippa School System during the 1930s - Henry Mancini. The Lehigh Valley's Adolph Lipsitz composed a song (which he used later in his march, Peace and Liberty) that was played by the Philadelphia Navy Yard Band at the launching ceremony of the battleship New Jersey. He had helped build the ship himself. Then there's Albertus Meyers of Richlandtown, conducting the Allentown Band for more than 50 years, yet writing only five marches because he was afraid of stealing someone else's melodies! Floyd St. Clair grew up in Braddock, and at 21 directed a steelworks. He would found several well-known orchestras throughout Pennsylvania. And finally, there's the infamous Harry Lincoln, a Williamsport music publisher who engaged in some shady business practices, leading to confusion over the true authorship of a number of "his" compositions. One of the standout pieces here is a medley of tunes by Stephen Foster, the pride of Lawrenceville. He was not even a band composer, but six of his immortal songs show up here in dynamic, colorful, multi-layered arrangements by Lucien Cailliet, the Allentown Band conductor, clarinetist, and masterful arranger for The Philadelphia Orchestra during the Stokowski era. Another notable work is Thomas Coates' 1893 Columbian National Potpourri, a medley of patriotic tunes featuring an imaginative re-harmonization of The Star-Spangled Banner, which wouldn't become our national anthem for another 38 years. The frantic and quite hilarious march, Midnight Fire Alarm by Harry Lincoln (we think! ), complete with alarm bell and sirens, brings the disc to a raucous conclusion.